Posted by Brittany Bosher on Monday, September 28th, 2015 at 8:09am. The beautiful and mesmerizing gardens at the Mounts Botanical Gardens in West Palm Beach can be duplicated in your own backyard. Mounts and its staff of botanical and gardening professionals are offering a series of classes exploring the basics of horticulture and garden design. The classes being offered are called the Design and Creating the Home Landscape” series. The classes are set for three Saturdays, October 3rd, 10th and 17th from 9 am to 1 pm in the auditorium. The leader of the classes will be horticulture expert, Laura McLeod. McLeod is a certified landscape designer and a skilled individual in the field of viticulture. She will teach the basics of design and each step of the growing process. Attendees will have the luxury of going out into the gardens to learn and see up-close the best plants for the south Florida environment. The classes will help educate you on how to care for your personal gardens and home landscape, which plants will thrive and how to keep them at their healthiest. For the final class, McLeod and other experts will review the landscape design created by the participants. 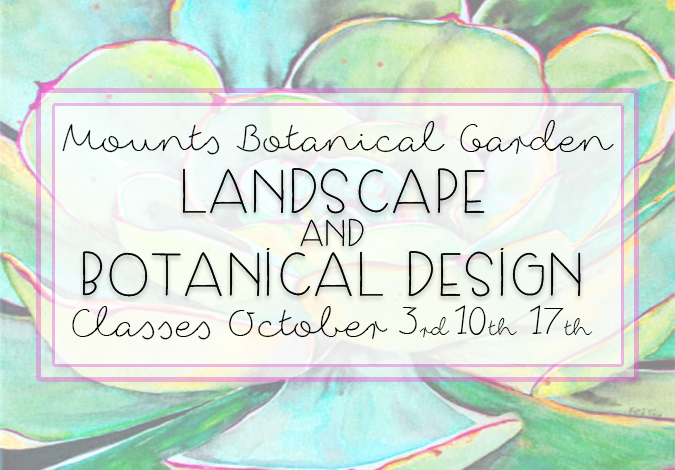 The Mounts Botanical Garden “Design and Creating the Home Landscape” classes will cost $60 for members of the Mounts Botanical Garden Society and $70 for non-members. This is the perfect thing to do for those who enjoy the tropical, Floridian landscape and the art of landscape design. For more information and/or to sign up please visit www.Mounts.org.